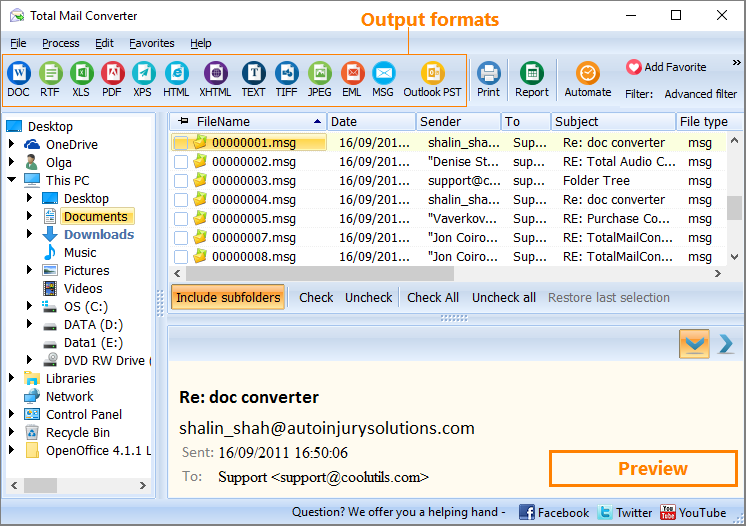 Total Mail Converter is one of the handiest file conversion utilities. It is intended for converting EML and MSG files to PDF, RTF, HTML, and TXT. By aid of Total Mail Converter, you can convert messages from any email client. This tool comes in handy when you have too many messages in your message box. Sorting between useful and useless emails can be a challenge, especially if you have hundreds in your box. Total Mail Converter will help you archive your emails in your most convenient fashion, so you can promptly extract a message any time you need it. Because the converter renders messages in different formats, you can work with them in several ways. If you would like to view your messages in various IT browsers, convert them to HTML. If you wish to work with your messages outside your mail client, save them in DOC (Word, RTF), TXT or PDF. To convert an email, you should first export it. Open The Bat!, select the folder with emails, go to the main menu Tools - Export messages to MSG. Conversion is an easy game. 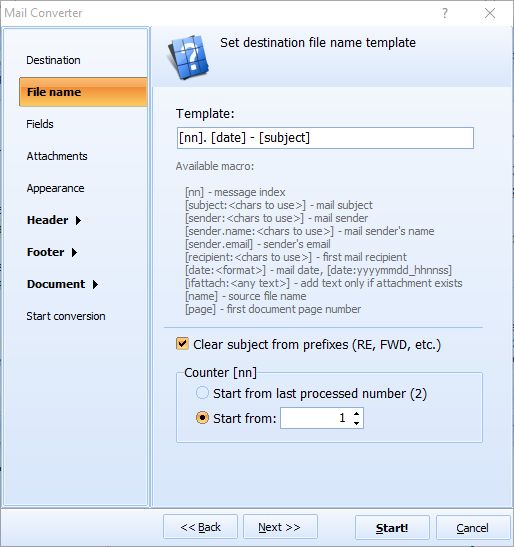 Open Total Mail Converter, select the folder with msg emails. Select the folder with your emails and check the messages you wish to convert to PDF, TXT, DOC or HTML. 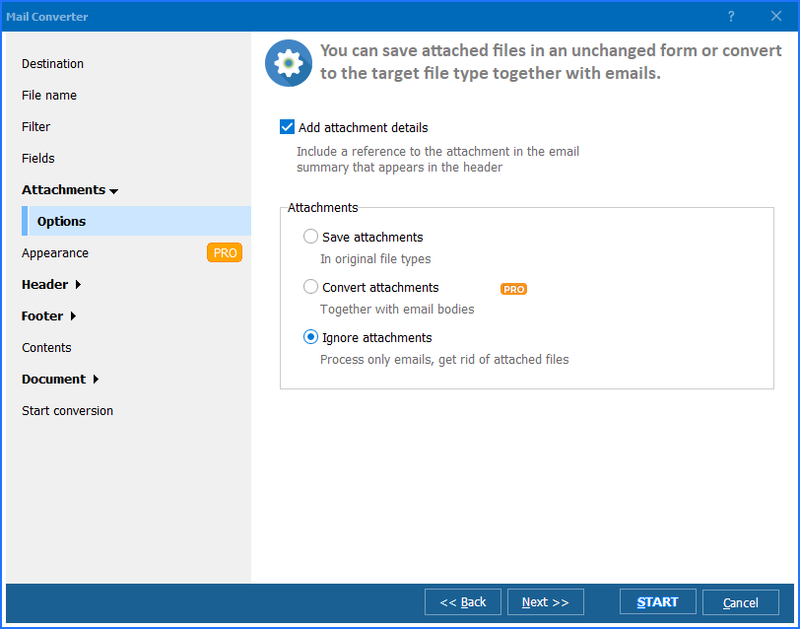 Total Mail Converter features batch function, by aid of which you can manage scores of files just as quickly as one file. To convert all messages, click Check All. All the emails will be check-marked automatically. You may select fields you want to export: Sender, Recipient, Date, Subject, or Body. The tool permits you to make attachments and choose folders, in which you would like to store your files. Total Mail Converter integrates into Windows. Once it is downloaded and installed, Convert to option appears in the right-button menu. In other words, you can manage your files right from the desktop, without launching the interface. Just right-click on a message and make your settings! Total Mail Converter has an intuitive interface. It does not take a geek's expertise to operate it. The Wizard will give you options, so you will not get off the track. Total Mail Converter is readily available on our website. You can place an order right now and get the key or use the trial version for 30 days to see how it works. 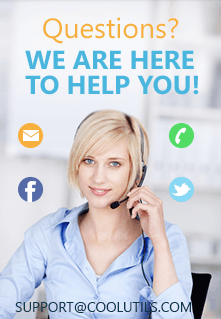 Registered users are entitled to free tech support and regular upgrades.